Where am I? › Home > White Papers > Time Warner Cable > Business Continuity: Leveraging cable MSO infrastructures for a reliable and effective solution. 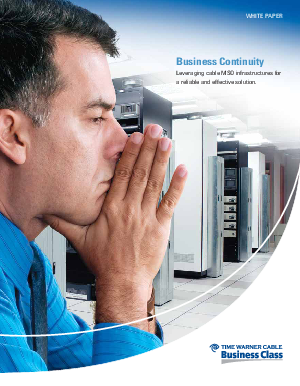 Business Continuity: Leveraging cable MSO infrastructures for a reliable and effective solution. Business continuity includes all processes and procedures that organizations put into place to ensure that critical business functions despite an event that disrupts normal business operations. 76% of companies experience at least one disruption in five years. 27% declare at least one disaster. It is essential for IT and business owners to identify potential risks, calculate downtime costs, choose the most effective technology and work together to implement recovery services. Cable MSO’s such as Time Warner Cable Business Class, are particularly well suited to meet the needs of companies exploring business continuity solutions to limit the cost and impact of downtime.